Product #2630 | SKU AT808G | 0.0 (no ratings yet) Thanks for your rating! To avoid phase cancellation and poor sound, all mic cables must be wired consistently: Pin 1-to-Pin 1, etc. For a high-impedance (Hi-Z) mic input, connect a Lo-Z balanced cable to a Hi-Z matching transformer (A-T CP8201 or equal) at the equipment input. 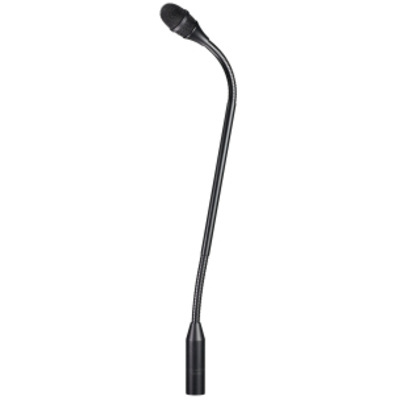 The flexible gooseneck is easy to manipulate for proper positioning. Heavily lubricated, it operates smoothly and quietly. Should the unit become noisy with prolonged use, apply a light machine oil directly on the gooseneck area affected. Take care to keep foreign particles from entering the windscreen. An accumulation of iron or steel filings on the diaphragm, and/or foreign material in the windscreen’s mesh surface, can degrade performance.